Carsons Crisp Cider, Maddens Mellow Cider, Doyles Cider – Dry, Medium, Sweet, Summer Fruit, Honey, Autumn Berry, Mollys Mulled Cider. AJ – Apple Juice, Honeyhill Spiced Apple, Cider Vinegar. Orchard Twist – Apple & Blackcurrant, Apple & Rhubarb, Apple & Ginger, Apple & Cranberry, Sparkling Apple. 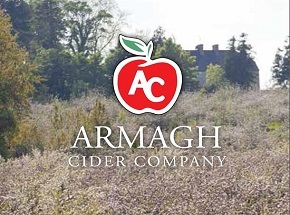 From its inception Armagh Cider products have won multiple National and International Awards including Gold, Silver and Bronze medals in both the International Cider Challenge and Blas na hEireann. Great Taste Awards 1* and 2**. Winner -Irish Food Quality Awards. Also Gold Medal Royal Bath & West Show and Gold Medal British Bottlers Institute. Throughout NI in Winemark, Tesco and Asda. Various pubs, restaurants, hotels and independent off-licences across NI and ROI.